LED grow lights… I really, really want LED grow lights to work for me! They seem like they would be the best of all grow lights for growing cannabis – they’re low on energy, low on heat, and also they just look cool! But if you know me, you may know that when I tried LEDs back in 2010 I was very disappointed. Despite all the magnificent claims, the yields I got with those LEDs were worse than what I got with (far cheaper) CFLs. The buds located directly under the light looked burned, and to add insult to injury the LED panel I had stopped working on one side halfway through a grow! At the time, I decided I was done with LEDs for a while and I upgraded to an HPS grow light instead. I haven’t tried growing cannabis with LED grow lights ever since. Yet the technology continues to mature, and as the years go on I’m seeing more and more growers using LEDs. My friend Endive is getting great results with his LEDs and I’m seeing lots of other growers getting impressive results, too. Today’s LEDs are obviously much higher quality than the ones available back in 2010! Maybe it’s time to give LEDs a second chance, but can they beat an HPS grow light? Currently I’m using a small 250W HPS grow light, and honestly I’m loving the results I’m getting with it! Because HPS grow lights come in sizes as small as 150W, they are becoming more popular as an alternative to LEDs for small, stealthy grows. 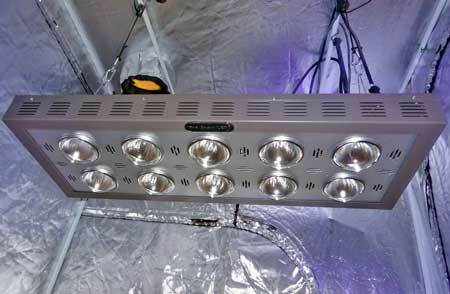 But if there’s an LED grow light out there that’s better than my HPS for small-scale growing, I want it! For more than 30 years HPS grow lights have been the “golden standard” and reigning champ of cannabis grow lights, but have LEDs finally surpassed them? For me, the answer is… No… but if LED grow lights could fix just 5 things, I would change over to them immediately! So what’s so special about LEDs? Why do growers keep coming back to them? Well, LED grow light panels have been around for many years now, and they have some really nice advantages compared to HPS grow lights that make them attractive to the potential cannabis grower. Efficiency – LED diodes are very electrically efficient, which could save you money over time (though the jury is still out when it comes to whether LEDs get better yields than HPS watt-for-watt). 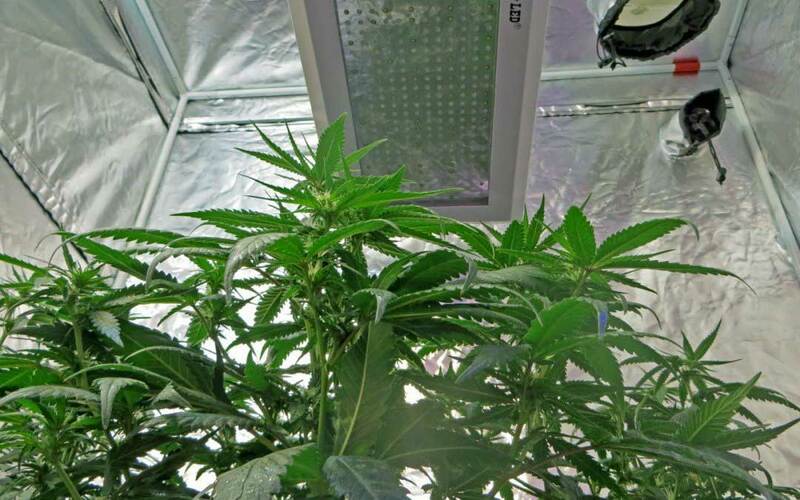 Additionally, where an HPS bulb needs to be replaced every few grows to maintain its brightness, individual LED diodes keep their brightness practically forever. With an LED grow light, it’s almost certain something else will break on the lamp before any diodes start losing their brightness. Plug-And-Play – LED grow lights are plug-and-play which means you can simply hang up the lamp over your plants and plug it directly into any standard electrical socket. HPS lighting requires the use of a ballast; for smaller models it can be built-in, but larger HPS lights generally need a brick-sized external ballast. 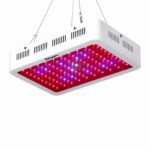 LED Grow Lights Come With Built-In Cooling – Along the lines of being totally plug-and-play, most LED lamps have heatsinks and small built-in fans to help disperse heat up and away from the lamp, which lets them run cooler. On the flip side, even a small HPS bulb needs extra help for cooling, usually by venting out hot air using a fan and ducting. Customized Color Spectrum – It is known that the color spectrum of light affects how plants grow. Unlike other grow lights which are pretty set in their color spectrum, each LED diode can be configured to emit light of a very specific color spectrum chosen by the user. This means that LED grow light color spectrums can be adjusted and customized in a modular way that’s impossible to achieve with any other grow light. Despite all the pros, I believe that LED grow lights still have 5 major problems that need to be addressed before I’m ready to switch over. If these 5 things were fixed, I believe we’d start seeing more growers everywhere using LED grow lights! So what do LED grow lights need to finally take over? 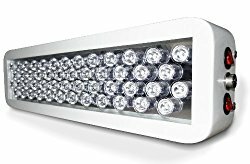 LEDs would completely outcompete HPS grow lights if…. There’s a common misconception that you can keep LED grow lights as close as you want to your plants as long as it’s not too hot. 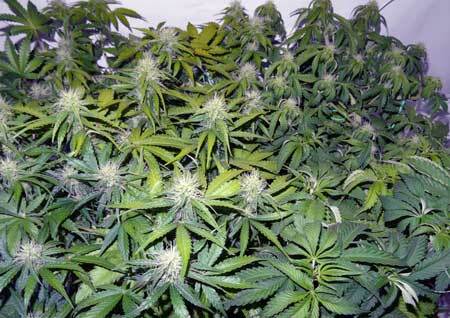 LED grow lights can burn your leaves and buds even if the temperature is perfect. The fact is that LED grow lights are so powerful they can actually deliver too much light to your plants and cause light burn. 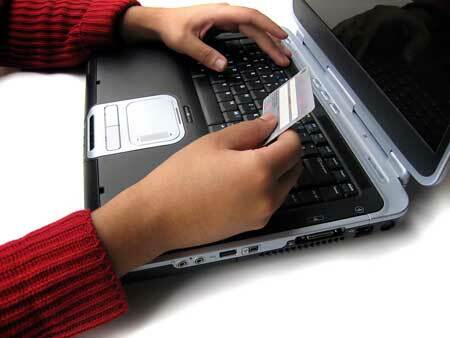 Often when LEDs are kept too close there aren’t any immediate symptoms. 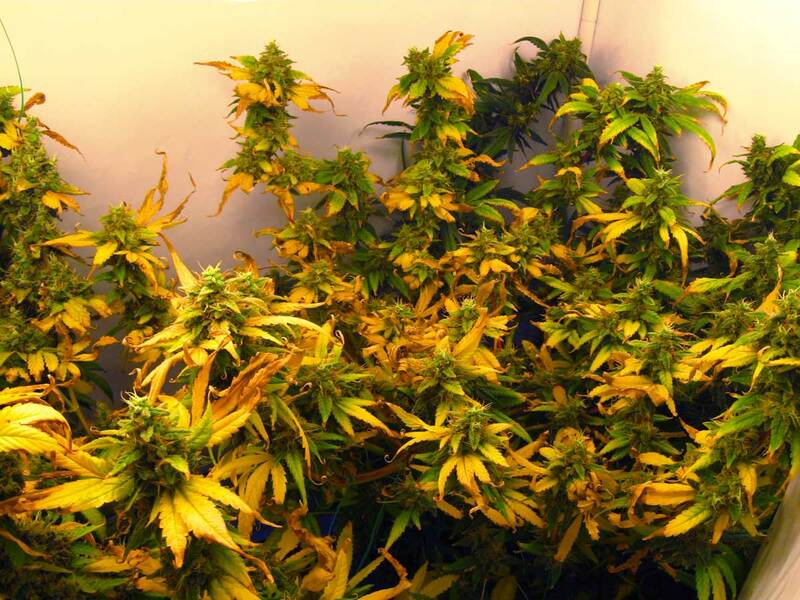 There may be yellowing and leaf death that happens slowly over the course of days or weeks. These symptoms tend to accelerate during the second half of the flowering stage and eventually spread to the buds themselves. When only the leaves directly under the LED are showing problems, it might be caused by the LED grow light being too close. For most LED models, the manufacturer recommends to keep the lamp 12-18”+ away from the top of your plant, and some of the more powerful models need 30” of clearance or more to make sure your plant isn’t getting too much light. I think a lot of growers don’t understand this and end up hurting their plants with the too-high light intensty, not understanding the root of the problem is their LEDs are too close. Why must LEDs be kept so far away? Many LED grow light companies are using increasingly more powerful lenses to focus light directly down onto the plant in order to increase the penetration (how much light gets through to the middle of the plant), but the problem is this requires growers to keep the lights further and further away to avoid light bleaching under the increased light intensity. This is actually the main reason I personally haven’t switched to LED grow lights yet – I don’t have the height in my grow space to convert over from my HPS! Example: Most LED grow lights (especially the more powerful ones) need to be kept 18″+ from your plants in order to avoid light burn due to the large LED diodes and powerful lens system. But some growers claim to get the best results from the biggest panels by keeping them almost 3 feet away! That means some LEDs need an extra foot of space between the lamp and my plants compared to my 600W HPS, which means I may need to get a taller grow space. Problem: Most powerful LED grow lights on the market today need to be kept 12-30” away (or more) to prevent light bleaching and early leaf death, which means that they may need more vertical room than some HPS models. 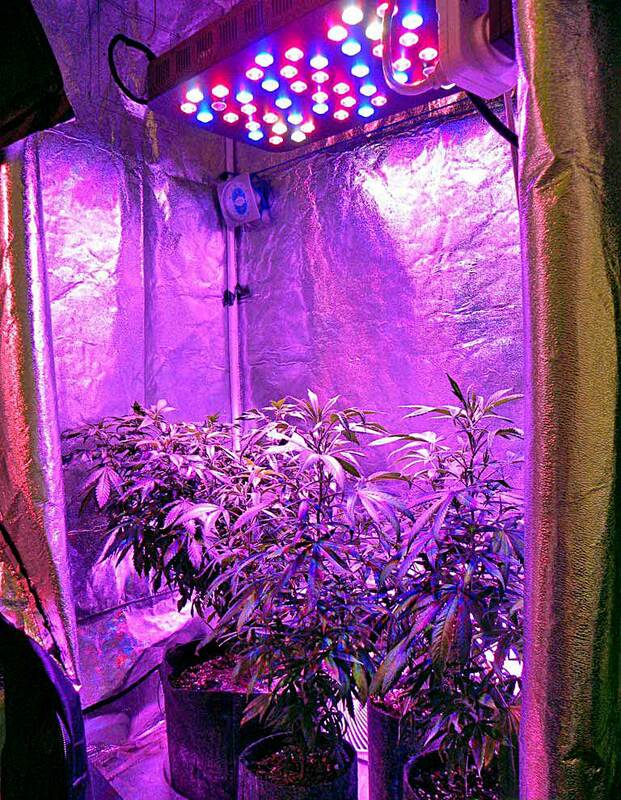 Solution: Find a balance between light penetration and intensity, so LEDs don’t have to be kept so far away from your plants! Let’s face it, many LED grow lights are expensive! Compared to an HPS light, the best LED grow lights might cost 3-10 times as much per unit of light produced. A brand new, top-of-the-line 600W HPS grow light could cost $200, but I could easily end up paying $800 or more for an equivalent LED grow light. For around the same price ($800), I could get an entire HPS 4’x4’x7′ growing setup, including not just the 600W HPS grow light, but also the grow tent, fans, etc. That being said, while there are expensive models, prices for LED grow lights have finally come down over the last few years. Problem: Premium LED grow lights often cost 3-10 times more than new HPS grow lights. 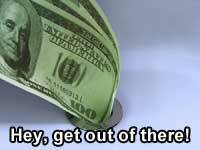 That being said, there are cost-effective options. Solution: When I first wrote this article in 2015, there were far fewer LED options than today. The prices have actually come down quite a bit over the last few years, and there are now some very reasonably priced LED grow lights. For example, ViparSpectra offers many models of LED grow light that cost around the same as an equivalent HPS grow light, and their lights have proven to work great for growing cannabis. Premium LED lamps can still cost over $1000 each! So if I get one 300W LED grow light panel, it would be a safe assumption that it works the same as all other 300W LED grow lights, right? Unfortunately the answer is no. For LEDs, proper usage tactics change quite a bit from model to model and manufacturer to manufacturer. Each lamp model uses a unique blend of colors, diode sizes, lenses, cases and more. Because of this, you may need to use even two similar models differently in order to get the best results, and some LEDs just plain work better than others for growing cannabis. This can be frustrating when you’re using an LED grow light and your plants aren’t doing well even though you’re following all the directions. Sometimes it’s just the light! If you want to try LED lights, make sure to check up on the reputation of the company first! 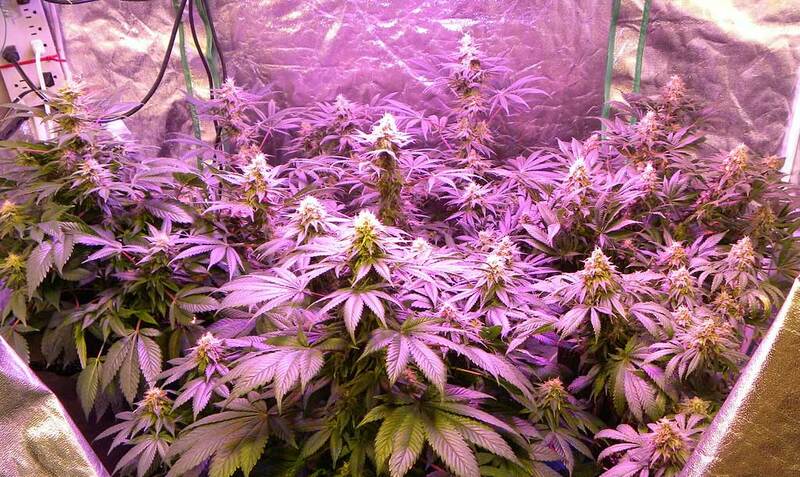 One of the great things about HPS grow lights is every lamp is used almost exactly the same as every other one. The bulbs come in the same sizes, the distance needed from the plants are the same, the color spectrum is consistently great for flowering cannabis plants, etc. The only real differences between HPS lights is how they’re cooled and the size of their footprint, which are determined by your hood/reflector. This means that every 600W HPS gets used almost exactly like every other 600W HPS, and you can plan your results around that. 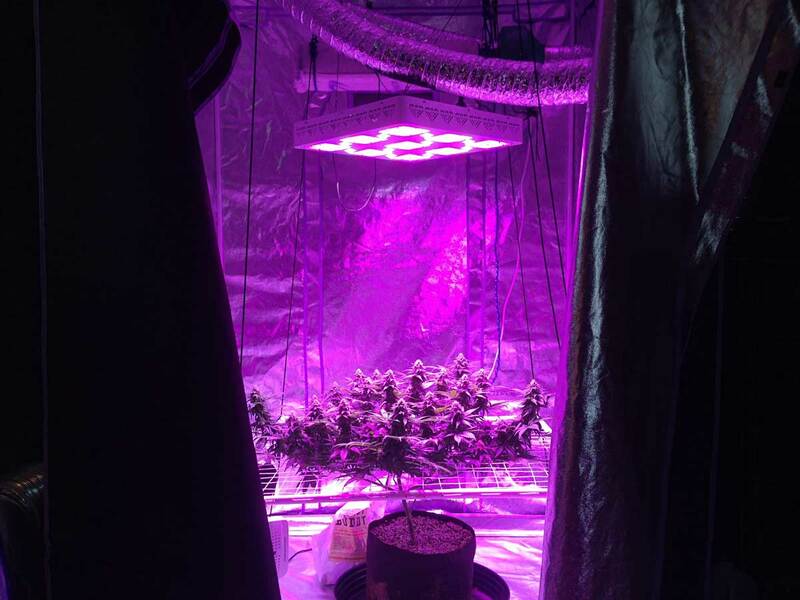 It also means there’s a lot more helpful support both online and in person for using HPS grow lights. 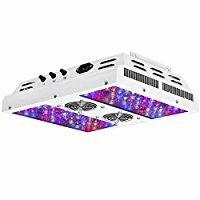 Problem: LED grow lights from different companies needs to be used differently since each model utilizes a unique blend of colors, diode sizes, lens sizes and angles, etc. Solution: Create standards, or at least better documentation, so growers know exactly what to expect and how to use their LED grow lights to get good results. The very first LED panel ever I got was in 2010. It drew 45W out of the wall and cost $130. I remember how excited I was to start using it. Unfortunately, halfway through one of my grows, one side of the panel went dark – the LEDs only lit up on one side after that. Unfortunately, in order to fix the problem I would have needed to get a completely brand new LED panel. And although a lot of reputable LED grow light manufacturers will fix or replace broken lights if they’re still under warranty, the pain of having to send your grow light away for several weeks can have severe ramifications for your plants if it happens in the middle of a grow. At the time I ended up throwing the LED panel away and switching back to CFLs, which let me successfully finish my grow. 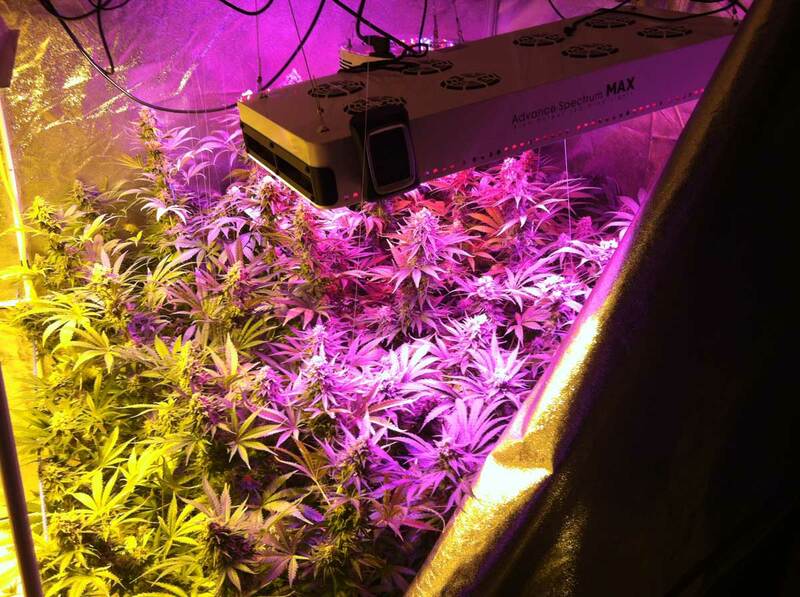 What happens to your plants if your LED grow light goes dark? Problem: There’s usually no way to fix a broken LED. You most likely have to replace the whole lamp or switch to different lighting while it’s being repaired. Solution: Make LEDs more modular so growers can replace or repair individual parts when they stop working. This is actually my biggest beef with the LED grow light industry (I guess not so much the lights themselves). LED grow light companies will usually give you information about bulbs and color spectrum, but there are many that will never actually explain how much electricity the lamp pulls from the wall, and more still don’t provide any information about how the LED is going to perform for your plants. The overall lack of information can be incredibly confusing – especially to new growers – and cause people to believe they’re buying something different than they actually are. This affects both good and not-so-good companies. Let’s look at an example: the Advanced Platinum P150 is a phenomenal LED grow light that many growers are getting really great results with, but how much electricity does it actually use? What are you really getting when it comes down to the numbers? The lamp uses 50 x 3W bulbs, which is where the “150” from the name comes from. Theoretically the bulbs are equal to 150W, but the actual draw from the wall is between 50-87W, depending on the setting you put the panel on. But the lamp is also the “equivalent” of a 250W HPS, though there’s no explanation of where that number comes from. With all the different numbers being thrown around, it’s really hard to understand what it is you’re actually getting. What exactly are you actually paying for? While there are great LED grow light companies with great products and customer support, I believe many other companies use this numbers confusion on purpose to prey on unsuspecting buyers who believe they’re getting more light and power than what’s actually being sold to them. And when it comes to what yields to expect, there are almost no companies that will tell you anything. In fact, most LED grow light companies won’t even talk about cannabis, never mind actually test their grow lights on real cannabis plants. To be fair, many companies selling HPS lights aren’t talking about cannabis or showing their products working for cannabis. However, HPS’ are in a unique situation in that their ability to grow cannabis isn’t questioned, it’s inconvenience (i.e. heat management) of using them that we all have a problem with. Problem: Even similar LED grow lights are described differently from company to company, and it’s often unclear how much electricity the product actually uses, or what type of results to expect. Solution: Explain how much electricity each LED panel actually draws from the wall, and stop using claims about “equivalency.” But more importantly give us evidence about how your lights work on real cannabis plants. We need more LED grow light companies working with actual cannabis growers! There you have it, the 5 things I think LED lights need to become king (or queen!) of indoor cannabis growing! Although LEDs have a bit of a ways to go, the high level of interest in them will ensure people don’t stop working towards making them better. I really want the benefits of LEDs, but for for me personally, it’s point #1 and #5 that prevent me from switching over from HPS. If LED grow lights needed the same distance from the plants as HPS grow lights, and performed just as well with less electricity I would get one immediately! But for me and the world to really embrace LEDs (and start moving away from HPS altogether), these 5 points need to be addressed! Kind K5 XL1000 LED Grow Journal – 1.2 lb Harvest!